In this continuing series called ‘Only at Expo,’ I am highlighting various things that you can do at Macworld Expo, but you can’t do at an Apple Store (no matter what Apple would have you believe). This time around we take a look at prizes (fabulous prizes make everything better!). Most people try to avoid looking foolish, but when those people attend a show and there is a chance for some kind of prize, that prime directive goes right out the window. Vendors around the floor hand out shiny, blinking baubles that act as an entry in a contest. The catch? The only way to win a prize is if you wear the silly vendor-specific bauble as you walk around the show floor—if the vendors select you from among the many be-baubled masses you, too, could finally be a winner. 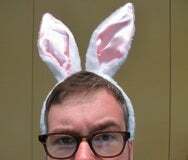 This is why you’ll see many people at Macworld Expo 2009 wearing rabbit ears, such as the pictured author. If I wore those rabbit ears to an Apple Store I won’t get jack squat beyond an odd look from the Genius Bar.